2 Behold our King, meek and gentle, seated on the colt, draws near with haste to suffer and to cut off the passions; the Word upon an irrational beast wishing to deliver rational creatures; and it was possible to see on the back of a colt the One who rides on the shoulders of the Cherubim, Who once took up Elias in a fiery chariot, He who is rich by nature making Himself poor by design, and weak by intention, He who empowers all those who cry to Him, “Blessed are You Who come to call back Adam”. 6 With palms infants sing your praise, calling You Son of David rightly, Master; For it was You who slew the Mocker, the spiritual Goliath. David the dancing maidens extolled after his victory, “Saul slew them in thousands and David in ten thousands”. That is: the Law, and after it, Your Grace, my Jesus. The Law was Saul, envying and persecuting, but David persecuted, sprouted grace, for you are David’s Son and Lord, Who come to call back Adam. 8 You showed Your strength in choosing penury, since for You to be seated on a foal is a form of beggary. But in glory You shake Zion. 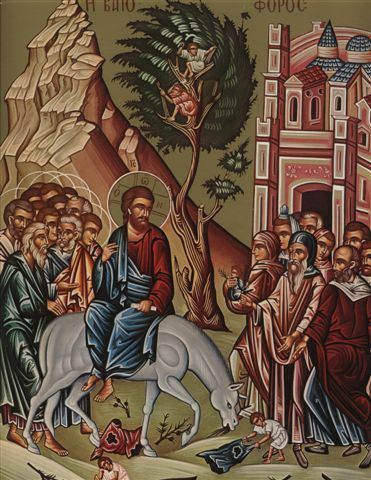 The disciples’ garments signified penury, but the sign of Your might was the hymn of the children and the gathering of the crowd crying “Hosanna”—that is Save now&mdash”in the highest”. Most High, save the humbled; Have mercy on us, as You look on our branches. Boughs that are brandished will move Your compassion, O You Who come to call back Adam. 9 Adam contracted for us the debt that we owe, by eating what he ought not, and until today it is demanded of us who are descended from him. The creditor was not satisfied with seizing the debtor, but he attacks his children too, demanding the ancestral debt, and empties the debtor’s house entirely, sweeping everyone away. And so let us all flee to one who is powerful. Knowing that we are in dire poverty, do You yourself pay back what we owe, for You are rich, Who come to call back Adam. 10 You have come to deliver all, and Your prophet Zachary, who once called You most meek, just and who save, is Your witness. We were wearied, we were worsted, we were utterly cast out; we thought we had the law as our redeemer, and it enslaved us; the prophets too, and they left us on our hope. And so with infants we bow the knee to You. Have mercy on us who have been humbled, be willing, be crucified, and tear up the record of our debt, You Who come to call back Adam.